This month’s theme is Overcoming Fear, and we’re exploring how to do that through the upcoming workshop series What’s Next (starts Sept. 28!) and the personal stories of several Hivery members (featured in blogs later this month!). I’ve been surprised in the years since launching The Hivery to see that fear is a characteristic shared by many, if not all of us. I’ve spoken with many women whom I deeply admire and look up to, women who seem from the outside like they have it all together. It's surprising and oddly reassuring when through deeper conversations, they open up about how they also experience fear and self-doubt. It’s been both eye opening and a relief to know that we don’t struggle alone. At the same time, I’ve also learned about learning to work with fear, and how wisdom, passion for what you believe in, and practice can indeed lead to a fearlessness, a willingness to be bold and do it anyway. I've learned through the brave women in our community and beyond that want to make an impact on the world we live in, that working with fear is a practice—and that practice can help many of us get to our own space of fearlessness. For right now, I don't treat fear as something I’ll get rid of, but something I’ve learned more and more to work with. It was a big revelation for me to learn how to manage, recognize, name it, move forward anyway, and recognize fear for what it was. Each phase of building and growing The Hivery has been an exercise in working with fear. 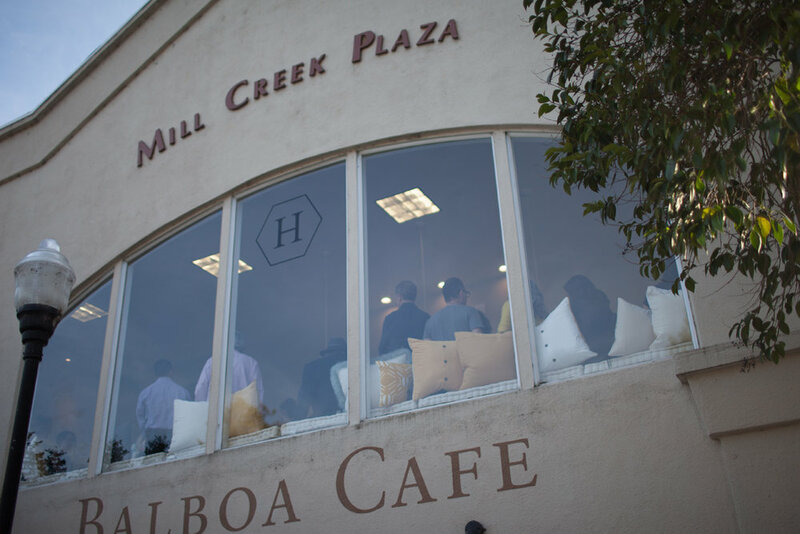 One of my most visceral moments happened in early 2016 when I was just weeks away from opening our Mill Valley location. I’d put every dollar I’d ever saved into creating the space and felt like its opening was the biggest risk I’d taken to date. While there was a lot on the line from a business standpoint, I also saw it as a public risk. I felt like I was putting myself out there in a highly visible way. And although I wanted to create something extraordinariy, that's not to say I wasn't FREAKED OUT. I live in Mill Valley and raise a family here. It’s a small community. My fear was that I would fail in front of the whole, damn town. This sick fantasy, almost without me realizing it, had been cycling through my head for weeks. But it wasn’t until the day I verbalized it to my friend that I started to see it as ridiculous. I realized two things: first, that failure could, in fact, materialize. And second, that even if I failed, the whole town had better things to do than to gather and laugh. And most importantly, when I asked myself if I still wanted to do it, even with that worst case scenario as an option, a voice deep inside gave a resounding YES. Looking back, I think playing out the worst-case scenario in my mind was helpful to putting things into perspective; and a recognition of how much I wanted to do it. Fear was loud, but I was determined. In that moment, I realized the feeling I was experiencing was deeper than the low-and-fluttery feeling of nervous butterflies. Under all of that was something more powerful than fear...it was exhilaration.I realized that fear is the twin sister of exhilaration, and exhilaration is the ultimate feeling of being alive. That moment changed everything for me. Today, when I feel fear creeping in, I remind myself, that fear = exhilaration = feeling alive. What do I want most in this life? To be fully alive. So get on the bus, Ms. Fear, because Exhilaration is coming, too. Fear is a known entity, but there are some straight-forward things you can do to keep it from ruling over you. Surround yourself with a supportive community. Fear often comes at a time of transformation; you wouldn’t be feeling fear if you didn’t want to create another layer of existence. When you’re in a state of transformation, you can become very vulnerable to the energies of other people. Be careful and treat yourself like a sensitive creature. Try to hang out with positive people. This isn’t a time to spend with people who are contributing to your fears or feeding you worst-case scenarios. That’s not to say that you shouldn’t have friends who are honest or practical with you, but I recommend being mindful with the company you keep, especially during this potent time. Keep perspective. Fear is often a manifestation of our self-limiting beliefs—insecurities and stories we’ve heard since we were kids. It can help to learn how to recognize and unpack those beliefs, but it can also help to simply ask yourself what you want in this short, little life. My guess is that you want to make a difference, you want to do something meaningful, you want to be your best self. When fear is re-labeled as exhilaration, you'll be free to do just that.